Has this hotel recently had a refurbishment? I don’t know. Our room and the hotel lobby was very nice. 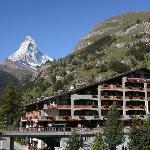 Get an answer from Allalin Swiss Alpine Hotel staff and past guests.